A huge collection of antique and vintage toys, amassed over almost 25 years, will be sold by auction in the Cotswolds in England this fall. Until June, thousands of individual teddy bears, dolls, puppets, train sets, model cars, and tin soldiers — some rare and valuable, many very common and familiar to visitors as toys from their own childhoods — were on public display at the Park House Toy and Collectors Museum in Stow-on-the-Wold. 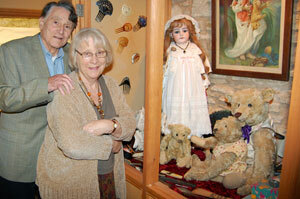 The museum was founded by George and Barbara Sutton in 1987, originally as an extension to their antiques business. 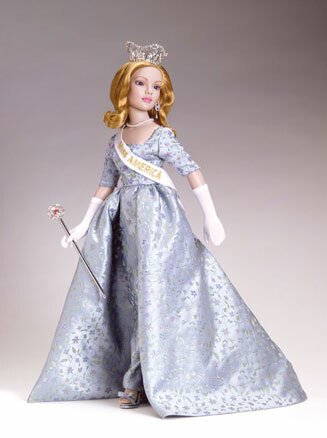 “Henrietta,” a Simon and Halbig doll dating from 1880, is one of the few toys not up for sale at the auction, along with “Wellington,” a 1908 Steiff bear bought by George Sutton in the Somerset town of the same name. 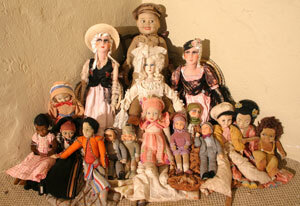 The Suttons caught the toy bug soon after opening their antiques shop. “We had a teddy bear in the window during Cheltenham Races week,” Barbara recalled. “We put a pair of binoculars round his neck and called him Racing Sam. “A woman came in from New Zealand. Her house had burned down and she had lost all her teddies, and she told us she couldn’t go back home without one, so she bought Racing Sam. 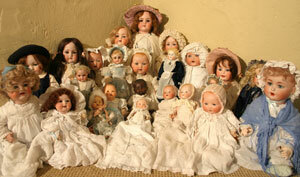 The couple admitted they were sad to see the collection go. “It’s heart-breaking to see the empty rooms; our collection was nearly 25 years in the making,” said Barbara Sutton. The collection also includes stuffed toys, including dozens of gollies, Smurfs, Paddingtons, Poohs, Yogis and characters from television shows including The Wombles and the Magic Roundabout. There are Barbies and Sindys, Action Men, Cabbage Patch Kids, Airfix models and posable figures including a wide range of Star Wars characters. 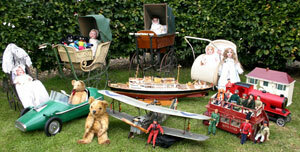 Victorian prams, high chairs and babies clothes, jigsaw puzzles and board games, and ride-on toys are also well-represented in the collection. Among the highlights are four cased Pelham Puppets theatres, with automated mechanisms to make the puppets dance on their strings, which are expected to achieve up to £800 or £900. A wax doll from the mid to late 1800s — pre-dating porcelain dolls — carries an auctioneer’s estimate of £300 to £500, and a “true to life” grizzly bear from the early 20th century with molded leather paws, could fetch £400 to £600. A full auction catalogue will be available online Sept. 5, 2011, and a special pre-sale viewing event will take place at the salerooms at Norcote, Cirencester, Wednesday, Sept. 28, 2011. For more information about the sale or about bidding by phone or mail, log on to www.mooreallen.co.uk. PreviousDolls in Danger: Courtney Love’s confessional “Doll Parts” still aches 20 years later. 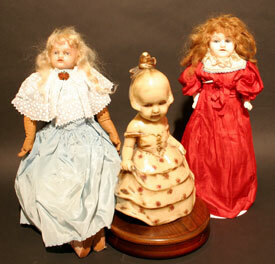 NextWe Love Lucy: A special anniversary gives doll collectors a chance to be in the show.